I mentioned before the holidays that my family was doing a thrifted/homemade Christmas. And it was a success. Sure, there are a few thing we’d do differently, like getting started sooner, but overall we gave and received a lot of great things. And I’m pretty sure all of us saved some money, too. By far, my favorite gift of the day was a quilt my mom made me (she also made one for my sister) out of fabric that had been my grandmother’s, who passed away when I was young. She was able to use fabric that had just be languishing away in a box in our basement and my sister and I got something really special. 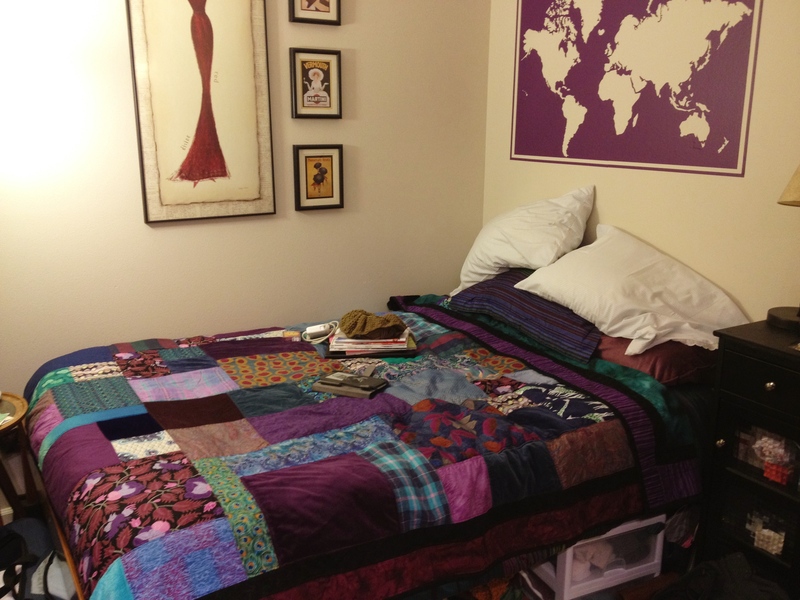 The quilt is gorgeous, goes perfectly with the colors in our room, and is something that I will cherish forever. My future husband (whoever he might be) will just have to deal with some purple in his life.